All that glitters is not gold, but who doesn't like a bit of shiny in their home. These taps by Griferias Maier are stunning. The Muse Diamond range is available in chrome, or 24 karat gold finishes and there is a choice of four interchangeable heads which feature Swarovski crystal elements. While the taps are simplicity in themselves, the luxurious heads epitomise glamour and elegance. They can be purchased either as a deck or wall mounted unit making them incredibly versatile in bathroom interior design. It is worth looking at the rest of their collection if you follow the link above. While these products may touch a niche market, there is certainly a steady demand by the discerning interior client wishing for a more sumptuous look in a bathroom. Burgbad are a German company with a high spec range of bathroom furniture. It is impossible here, to expand on how huge are the selection of products. Instead let's look at the this one piece which is shown with a glass floral front. High gloss and gold leaf are also available. Crystal handles are available on many ranges. 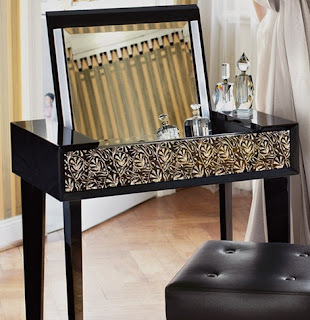 This dressing table also incorporates a folding illuminated mirror - perfect when applying make up. The Drizzle chandelier by Ochre is gorgeous. The round version is in 30cm, 60cm, and 100cm sizes. Available also in spiral, rectangular, and wall lighting. 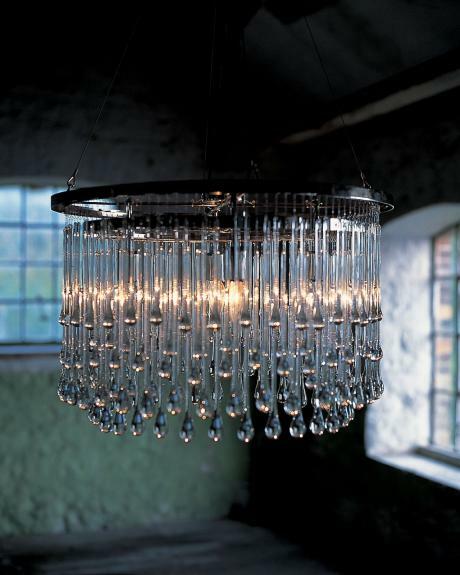 Made from polished nickel, with clear glass drops, it looks fabulous in both traditional, and contemporary living areas. With a slight industrial feel, it perfectly reflects the current trend for minimalist statement pieces. 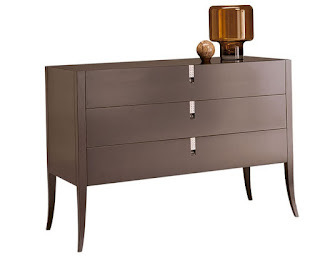 This chest of drawers by Selva also has Swarovski elements and forms part of their Solitaire collection. While quite a classical piece, we feel it would sit at home in many a contemporary interior. There are eight available wood finishes including walnut, and dove grey making it easy to co-ordinate with many styles. Contact me for information re products shown here for stockists and prices.